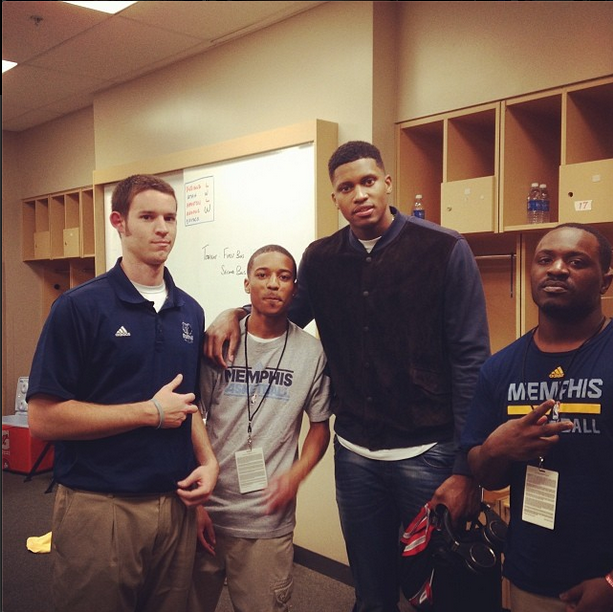 NBA player Rudy Gay of the Toronto Raptors was photo’d in a sold out $1,195 Gucci Suede Front Jersey Varsity Bomber Jacket which Meek Mill last wore here! 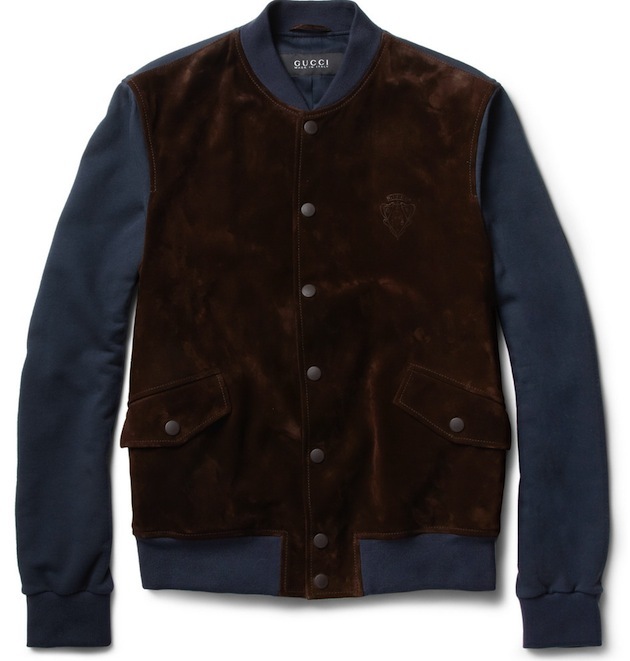 This jacket features a brown suede front panel connected to navy cotton sleeves and back, two side pockets, press-stud fastenings, then ends with ribbed cuffs and hem. Are you feeling this jacket? It feels good to see Rudy back on YDBR! Yesterday Wednesday (September 17), Actress Taraji P Henson made her press rounds in NYC. For one of her appearances, the Howard University alumni styled a $520 Faith Connexion Rose-Print Neoprene Dress with $950 Gucci Ursula Python Ankle Strap Sandals. 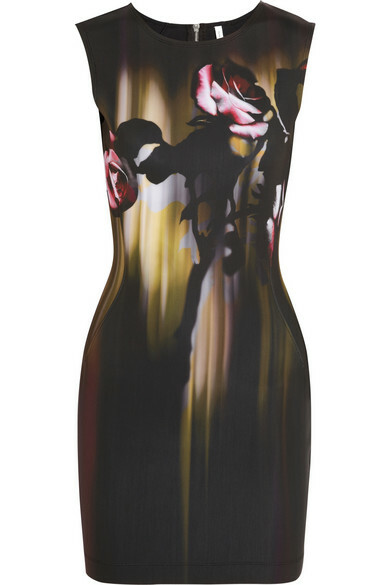 This black dress is printed with a blurred rose motif. You can purchase the dress at Net-A-Porter. These ankle strap sandals features python skin throughout and they’re available at Gucci. Next Tuesday (September 24), Henson will return to CBS for Season 3 of Person Of Interest. The show airs at 10pm. 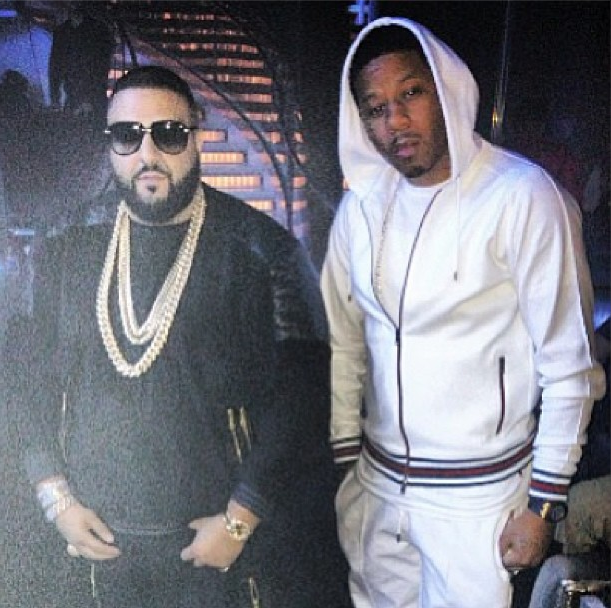 We The Best rapper Vado was photo’d filming his segment at DJ Khaled’s “I Wanna Be With You” video shoot with Future, Nicki Minaj and Rick Ross. The track appears on DJ’s Khaled upcoming album, Suffering From Success, due September 24th via YMCMB/Republic Records. 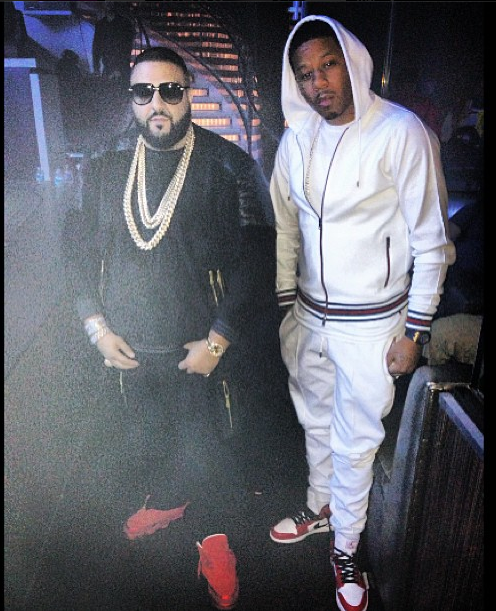 Vado rocked a $715 Gucci White Felted Toweling Hooded Sweater with the brand’s matching $555 Felted Toweling Pants. These pants feature an adjustable tie waistband, side slash pocket and back patch pocket. Get them at Neiman Marcus. 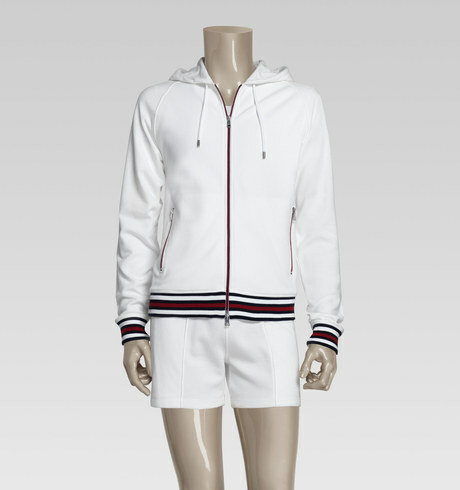 The hooded sweater features the brand’s blue and red signature web detail on the cuffs and wasitband, a front zip closure, side zip pockets, and a hood with drawstring detail. It’s available at Neiman Marcus. 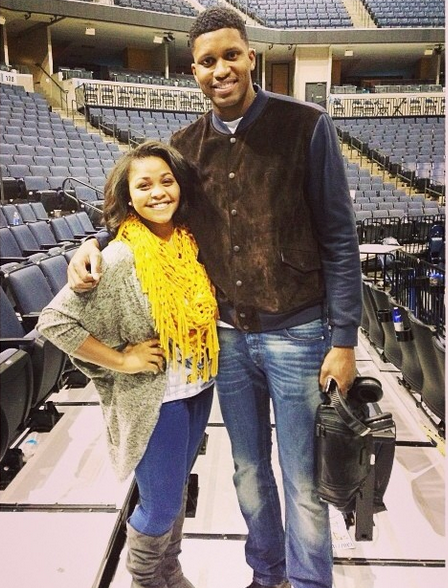 He also rocked a pair of Air Jordan sneakers. Vado’s Slime Flu 4 drops August 15th. 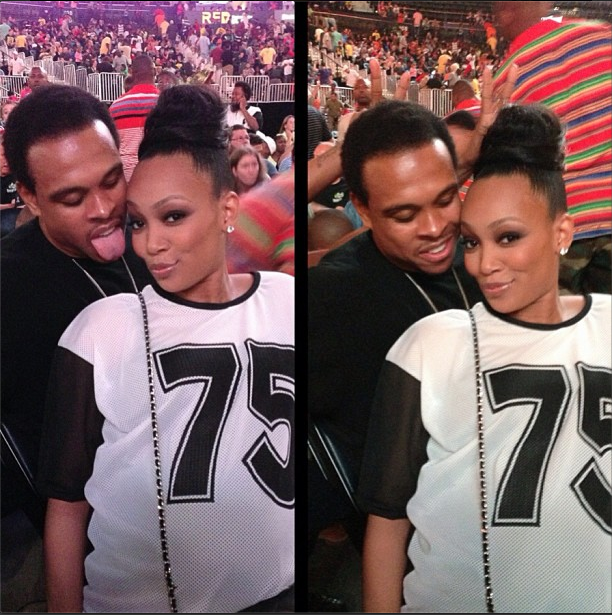 Last week, singer Monica and her husband Shannon Brown took the kids to WWE Live. For the wrestling event, a pregnant Monica dressed in an oversized H&M jersey top and $30 ASOS Leggings in Aztec Tribal Print. These form-fitting Monochrome Aztec design leggings are available at ASOS. She topped her outfit off with a Chanel bag and $690 Gucci Coda Neon Leather High-Top Sneakers which are from the fashion house’s Summer 2013 collection. They are completed with a perforated leather upper with tonal trim, tonal laces and sole, and interlocking G detail on the tongue. You can buy Monica’s sneakers at Neiman Marcus or Gucci. 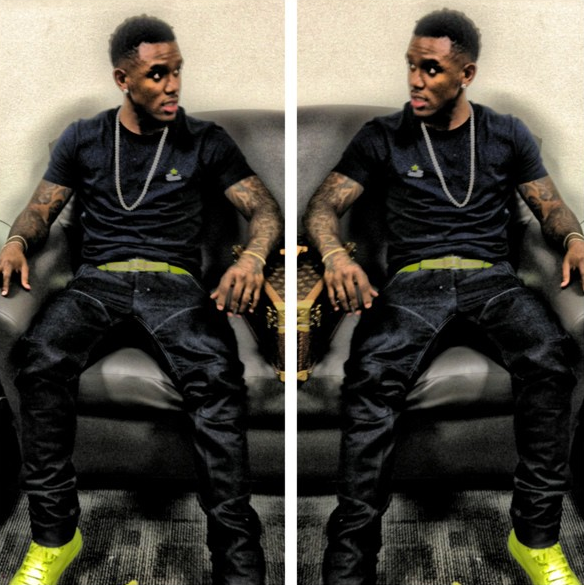 NBA player Daniel Gibson (Booby) of the Cleveland Cavaliers attended Essence Music Festival weekend in New Orleans. His wife, Keyshia Cole performed at the Mercedes-Benz Superdome. Booby was spotted backstage decked out in Gucci. He wore a $295 Blue Cotton Jersey Gucci Shirt and blue denim jeans accessorized with a neon belt which is either Fendi or Gucci (I can’t see the belt completely because he’s sitting down) and $690 Gucci Coda Neon Yellow Leather Sneakers. These sneakers feature an embossed Gucci signature on the heel and eyelets with Gucci’s logo. You can purchase these kicks at Gucci or Neiman Marcus. Singer Letoya Luckett recently wore them here. Rapper Fabolous and media personality Terrance J also wore these sneakers here, model Jourdan Dunn wore them here and Cassie wore them here. 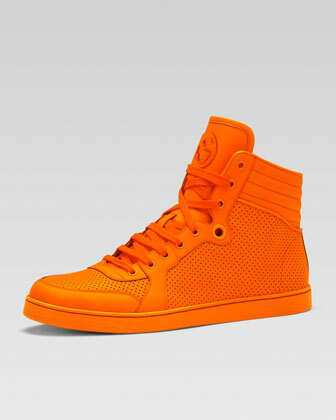 Are you feeling these very popular neon Gucci kicks? K. Michelle had a little too much fun as she danced on table tops in a white tee-shirt and ripped denim jeans paired with $640 Coda Neon Pink Leather Gucci Sneakers which are from the brand’s summer 2013 collection. 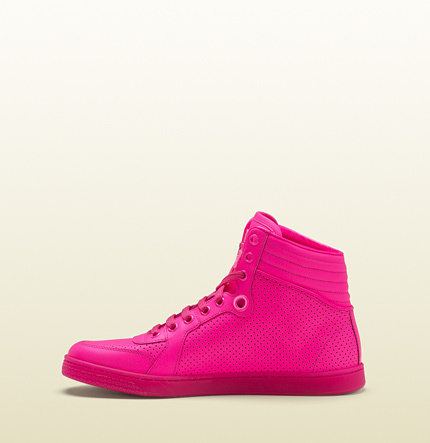 These neon pink leather sneakers feature eyelets with Gucci’s logo and an embossed Gucci signature on the heel. You can buy K. Michelle’s sneakers at Gucci. Maybe, K. Michelle is celebrating because she just released the official visual to her single “V.S.O.P.” and her new album, Rebellious Soul is due August 13th on Atlantic Records. Musically, I do not know what LeToya Luckett is up too! 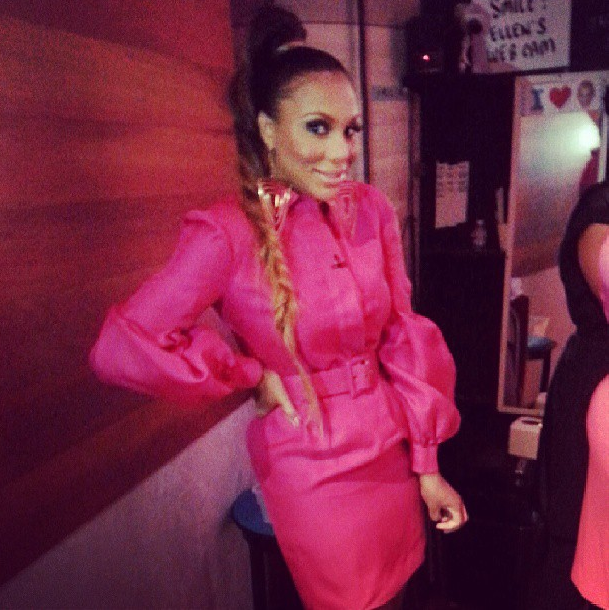 She was spotted at the 2013 BET Awards last weekend. 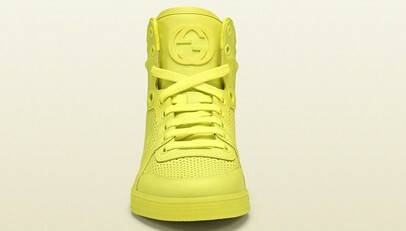 The platinum-selling R&B singer is the latest celeb spotted wearing these neon yellow Gucci sneakers. She was photo’d in a boxing ring wearing a black top and tights paired with $690 Gucci Coda Neon Yellow Leather Sneakers. 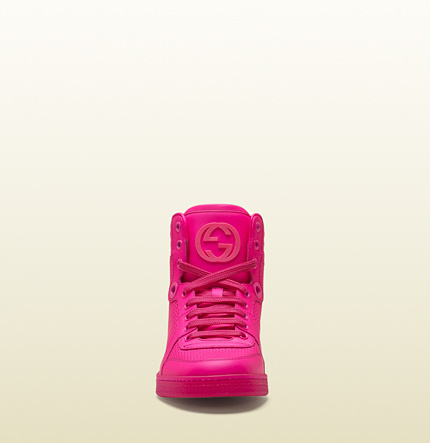 These sneakers feature an embossed Gucci signature on the heel and eyelets with Gucci’s logo. You can purchase these kicks at Gucci or Neiman Marcus. Rapper Fabolous and media personality Terrance J also wore these sneakers here, model Jourdan Dunn wore them here and Cassie wore them here. Singer Cassie is the latest celeb spotted wearing these neon yellow Gucci sneakers. She was photo’d getting off her private jet in a black sweatsuit paired with $690 Gucci Coda Neon Yellow Leather Sneakers. These sneakers feature an embossed Gucci signature on the heel and eyelets with Gucci’s logo. You can purchase these kicks at Gucci or Neiman Marcus. 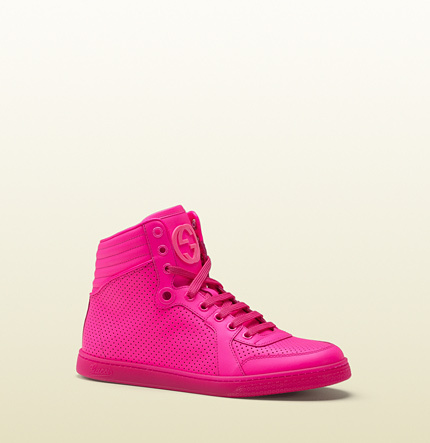 Rapper Fabolous and media personality Terrance J also wore these sneakers here and model Jourdan Dunn wore them here. Do you like Cassie’s look? 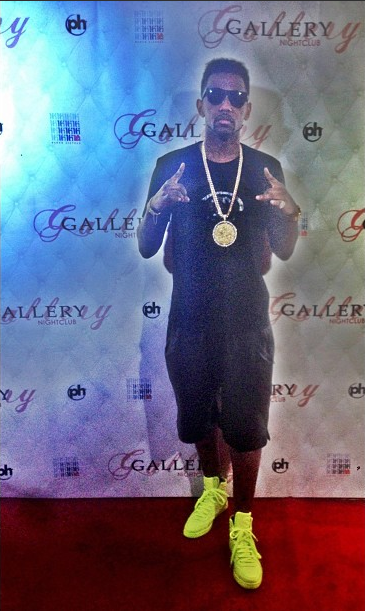 Rapper Fabolous walked the red carpet at Gallery Nightclub in a black tee-shirt and leather shorts paired with $690 Gucci Coda Neon Yellow Leather Sneakers. These sneakers feature an embossed Gucci signature on the heel and eyelets with Gucci’s logo. You can purchase these kicks at Gucci or Neiman Marcus. Model Jourdan Dunn also wore these sneakers here. 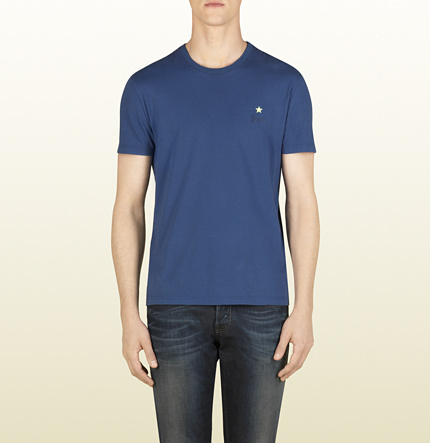 Do you like this look? 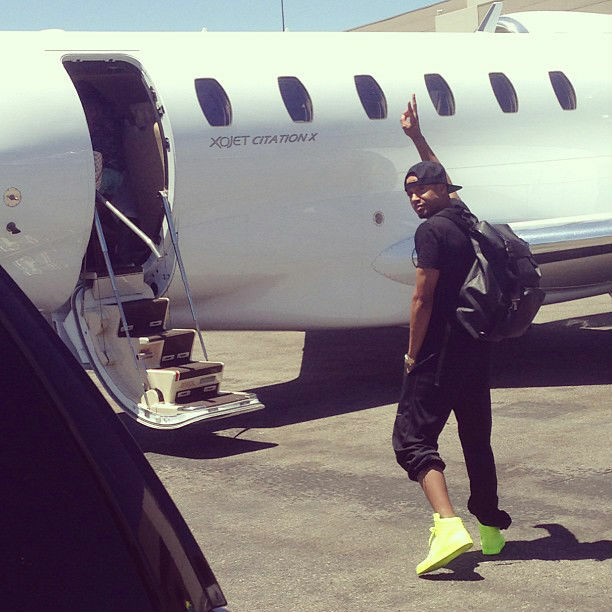 Media personality and actor Terrance J was spotted boarding a private jet in the same exact $690 Gucci Coda Neon Yellow Leather Sneakers that Fabolous had on above. He wore his with a black ensemble and backpack.